NEW BRITAIN – Voters got an up-close look at candidates for the 5th District seat in the U.S. House of Representatives Wednesday night as Democrat Jahana Hayes and Republican Manny Santos debated at Central Connecticut State University. Hayes, 2016’s National Teacher of the Year, and Santos, former Mayor of Meriden, took to the stage in Alumni Hall to address major issues of interest to voters. From college tuition debt to the environment, Hayes and Santos disagreed on most issues discussed Wednesday night. Perhaps the biggest disagreement of the night between Hayes and Santos related to student loans and college debt. Hayes said a good way to combat rising tuition rates and the rising cost of student loans is to stop predatory lenders from targeting students. 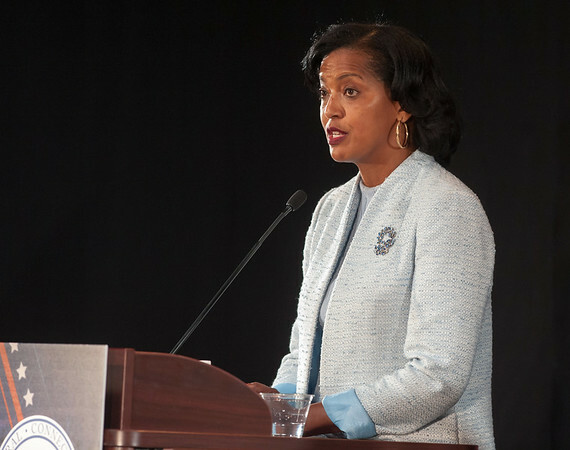 Hayes also said students should have more opportunities for grant programs to help pursue higher education without having to pay back loans. “I too am someone who holds a tremendous amount of student loan debt and didn’t really understand that I graduated from college with over $100,000 in debt for a job that paid me $26,000 – that should not be happening, that’s not how we get young people back to work,” Hayes said. Santos said - to groans and boos from the crowd – that many students bring this debt upon themselves. 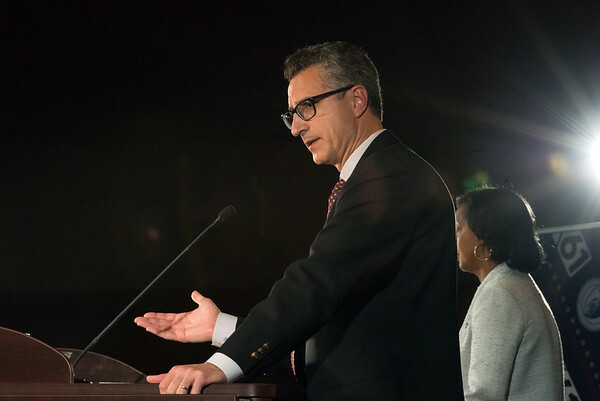 Santos encouraged students to work their way through college and not expect to be bailed out from their loans. “When you enter college, you enter understanding that these loans have to be paid back, so it’s important that you have consultation with your parents to make sure that the career your choosing is one that you will be able to then pay back these loans that were given to you,” Santos said. Still, Santos said that rising tuitions are a problem for students. Santos said mental health is a huge issue when it comes to gun violence, and oftentimes those who commit mass shootings acquire their guns illegally. He said he’s supportive of enhancing security in schools. “These mass shootings are heart wrenching,” Santos said. Hayes said she would fight against any legislation that would arm teachers with guns in schools. The Democrat said, among other things, that she’s in favor of expanding universal background checks on firearms. When asked about the country’s opioid crisis, candidates agreed something must be done. Santos said that there are about 115 deaths a day nationwide from opioid-related incidents. The Republican said a solution can be found if people are brought together to discuss what’s happening. “We have to make sure that our medical community is involved in reaching solutions to this problem,” Santos said. Hayes said this crisis has been going on for years before it was on everyone’s radar. Hayes said she’s dealt with addiction in her family for more than 30 years. Hayes and Santos were asked about environmental challenges in the state. Santos spoke about the negative impact environmental regulations have on the economy and said it’s important to know the impact regulations will have. Specifically, Santos said that the state’s Clean Water Act has excessive provisions in it that make business hard. “Nobody wants dirty water, dirty soil or dirty air, but we also have to make sure that the businesses that have to operate in our society have their flexibility to be able to do what needs to be done,” Santos said. Hayes responded bluntly. The Democrat said the lack of regulations is what has caused environmental problems to begin with. “I’m not willing to trade our environment for the economy. This idea that we have to ignore what manufacturers and businesses are doing to make money and ignore what happens to the economy is something I will never sign onto,” Hayes said. 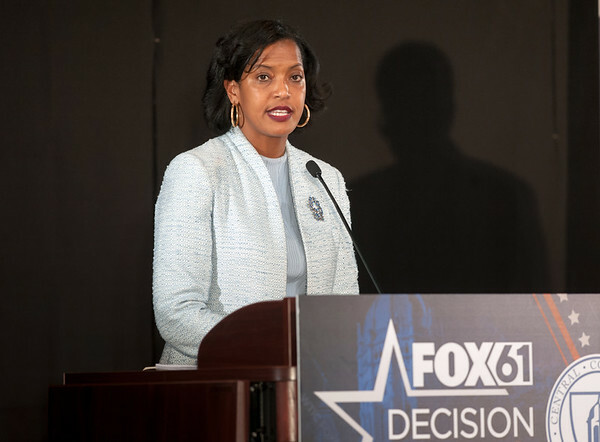 The candidates agreed that high taxes were driving businesses and young people out of Connecticut, and both said skilled labor was important in the state’s changing economy. Another audience question, though, had the candidates on opposite sides of the spectrum. When asked about their support of gay marriage, Hayes said she’ll do whatever she can to support the LGBTQ community. “They should not be discriminated against based solely on their sexual orientation and gender identification,” Hayes said. Santos said he would support rights and anti-discrimination legislation regarding the LGBTQ community, but he personally is not in favor of gay marriage. “I believe that it’s between a man and a woman, that’s what I believe a marriage should be,” Santos said. The 5th Congressional District is considered Connecticut’s most competitive district. While the district usually votes Democratic in presidential elections, it has recently voted for Republican candidates for governor. Before now-U.S. Sen. Chris Murphy, a Democrat, won the House seat, Republican Nancy Johnson represented the district for more than 20 years. This is the only open congressional race in Connecticut this year. Democrat Elizabeth Esty announced she wouldn’t seek re-election in April after news broke that she had not acted quickly after discovering that her former chief of staff had harassed a co-worker in her office. The debate was organized by CCSU’s Center for Public Policy and Social Research and was co-sponsored by the William A. O’Neill Endowed Chair in Public Policy and Practical Politics, the CCSU Political Science Department and the Student Government Association. 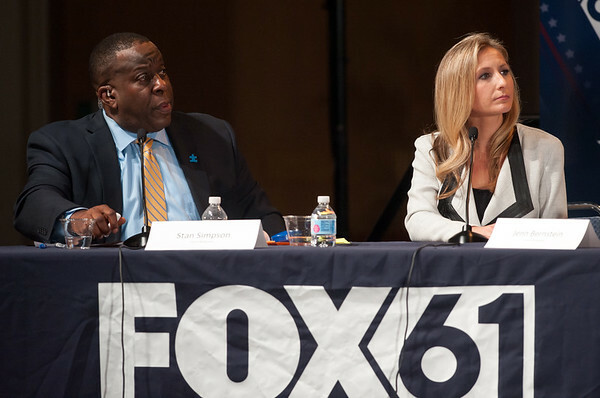 Jenn Bernstein, chief political reporter for WTIC-TV (Fox 61) and co-anchor of the station’s “The Real Story,” co-moderated the debate with Stan Simpson, host of Fox 61’s “The Stan Simpson Show” as well as holder of the Robert Vance Chair in Journalism and Mass Communication at CCSU. Questioners included a student government representative; a reporter from The Recorder, CCSU’s student newspaper; and Professor Robbin Smith, chairwoman of the Political Science Department. Posted in New Britain Herald, General News, New Britain, State on Wednesday, 17 October 2018 22:09. Updated: Wednesday, 17 October 2018 22:12.